Crystals are pristinely organized energy matrices. as products of natural occurrences, they realign us to the natural vibrations of all organic things. Placing one in the center of your body "tunes" and balances your system to these pure vibrations. Clear quartz is called the master crystal because it is an adaptogenic superconductor, restructuring the energy of your entire system. Clear quartz is used in computer processing because it has a molecular structure ideal for absorbing, storing and transmitting energy. This makes it especially good for amplifying intentions and manifesting. 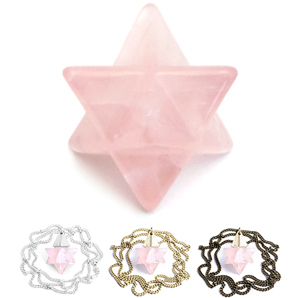 Rose quartz is specially tuned to the heart. Wear it to reawaken the innate love that resides within. Rose quartz brings soothing feminine energy to painful emotions. It is excellent for finding balance after mental activity. Meditating with rose quartz restores the light and airy nature of your etheric body. Smoky quartz grounds and recharges you. It absorbs negative energy and replaces it with steadiness, leaving you feeling empowered, strong and clear. Good for those with a lot of responsibility or who need help motivating towards action. Meditating with smoky quartz draws consciousness into the body. Opalite works specifically on your third eye (pineal gland) — the biochemical mechanism through which we perceive reality. It is the seat of your intuition. Opalite brings clarity to your perception, which allows you to see situations objectively and recognize the benevolent opportunities that surround you. Howlite stimulates higher consciousness and attunes your whole system to that awakened energy. This crystal has the power to ground you, elevate your emotions, stimulate creativity and clarify your mind. Howlite is for those seeking an experience of themselves beyond the mundane. Citrine is known as the stone of prosperity because it transmutes negativity into joy and leaves you radiant and magnetic. Citrine grounds the body, stirs the soul’s fire for truth and clears your mind. 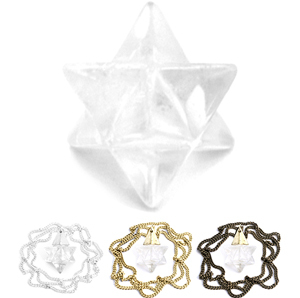 This crystal is for those bringing their dreams into tangible form. Meditate with citrine to strengthen the connection to your higher Self. White jade is a subtle crystal that connects the heart to higher consciousness. It stimulates intuition and keeps you focused on matters of ultimate concern. White jade is an etheric stone, especially supportive for those with a solid foundation who are seeking to access wisdom and create harmony in themselves and the world around them. Amethyst radiates a simultaneously uplifting and soothing energy. It purifies the mind, activates your third eye (pineal gland) and tunes you into intuition and higher consciousness. By connecting the 6th and 7th chakras amethyst creates a graceful ease, clears the heaviness of the subconscious mind, and supports peaceful relating. Tigers eye brings integration and integrity. It has a significant ability to stimulate and unite strength, emotion and action, giving the wearer powerful clarity and vision. This crystal is for leaders, visionaries and manifestors.